Riverhead, NY - June 21, 2018 - Suffolk County District Attorney Timothy D. Sini was joined by the U.S. Drug Enforcement Administration (DEA), the Suffolk County Police Department and the U.S. Postal Inspection Service today to announce the indictment of 11 individuals, including two Nassau County Police officers, as the result of a Grand Jury investigation in connection with an alleged drug distribution ring operating on Long Island. District Attorney Sini also announced a separate indictment against one of the defendants along with two other individuals, one of whom is a Nassau County Police officer, in connection with conspiracies to commit robbery. “This investigation started out as a narcotics investigation, but we came across information regarding something unique and that was a casino heist involving an active police officer,” District Attorney Sini said. The District Attorney’s Office, in conjunction with the Drug Enforcement Administration, Suffolk County Police Department and U.S. Postal Inspection Service conducted an investigation into the alleged illicit distribution of drugs by Daniel Caceres, 29, of Port Jefferson Station. Caceres has allegedly been operating a drug distribution ring since as early as October 2016. He is alleged to have purchased packages of marijuana and other narcotics, had the packages delivered to the various residences of his co-conspirators, then retrieved those packages for distribution. Caceres was indicted on June 15 on charges of Conspiracy in the Second Degree, Conspiracy in the Fourth Degree, Criminal Possession of a Controlled Substance in the First Degree, Criminal Possession of a Controlled Substance in the Second Degree, two counts of Criminal Possession of a Controlled Substance in the Third Degree, Criminal Possession of a Weapon in the Second Degree, Criminal Possession of a Weapon in the Third Degree, Criminal Use of Paraphernalia in the Second Degree, Criminal Sale of a Controlled Substance in the First Degree, and Attempted Criminal Possession of Marijuana in the First Degree. 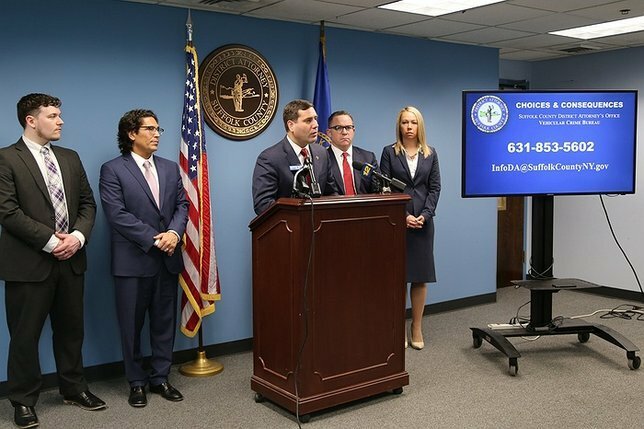 Indicted in connection with this scheme are Erik Skoglund, 28, of Port Jefferson Station, and Karen Ernst, 32, of Bethpage, both of whom are employed as Nassau County Police officers. Skoglund is charged with Conspiracy in the Fourth Degree and Criminal Possession of a Controlled Substance in the Seventh Degree. Ernst is charged with Criminal Facilitation in the Fourth Degree. Pursuant to the investigation into the alleged drug ring, Suffolk County Police detectives assigned to the District Attorney’s Squad and DEA agents executed search warrants on June 4 at 11 locations in Suffolk County affiliated with the defendants, including residences and storage units in Port Jefferson Station, Coram, Bellport, Mount Sinai, Ridge, East Patchogue and Mastic. Evidence obtained during the search warrants, in addition to the intelligence gathered throughout the investigation, resulted in charges against 11 individuals in three indictments, including Caceres, Skoglund and Ernst. Sedrick Ambroise, 26, of Bellport, is charged with Conspiracy in the Fourth Degree, Criminal Possession of Marijuana in the First Degree and Criminal Possession of Marijuana in the Second Degree. Richard Caceres, 32, of Coram, is charged with Criminal Possession of a Controlled Substance in the Third Degree and Criminal Possession of a Controlled Substance in the Fourth Degree. Jake Marino, 26, of Port Jefferson Station, is charged with Conspiracy in the Second Degree, Conspiracy in the Fourth Degree, two counts of Criminal Possession of a Controlled Substance in the Third Degree, Criminal Possession of Marijuana and Criminal Possession of a Controlled Substance in the Seventh Degree. Sean Mears, 30, of Ridge, is charged with Conspiracy in the Second Degree, two counts of Criminal Possession of a Weapon in the Second Degree, two counts of Criminal Possession of a Weapon in the Third Degree, Criminal Possession of a Controlled Substance in the Third Degree, Criminal Possession of a Controlled Substance in the Fifth Degree, three counts of Criminal Possession of a Controlled Substance in the Seventh Degree, Unlawful Possession of Marijuana and two counts of Criminally Using Drug Paraphernalia in the Second Degree. James Postiglione, 27, of Port Jefferson Station, is charged with Conspiracy in the Second Degree, Conspiracy in the Fourth Degree, Criminal Possession of Marijuana in the Fourth Degree and Criminal Possession of a Controlled Substance in the Seventh Degree. The second indictment charges Francisco Delgado, 21, of East Patchogue, with Criminal Possession of a Weapon in the Second Degree, three counts of Criminal Possession of a Weapon in the Third Degree and Criminal Possession of Marijuana in the Second Degree. It also charges Malfalda Lizardo, 59, of Patchogue, with two counts of Criminal Possession of a Controlled Substance in the Third Degree, Criminal Possession of Marijuana in the Second Degree, and two counts of Criminally Using Drug Paraphernalia in the Second Degree. The third indictment charges Michael Demaria, 31, of Mastic, with two counts of Criminal Possession of a Weapon in the Third Degree and Criminal Possession of Marijuana in the Fifth Degree. During the course of the investigation into Caceres’ alleged drug distribution ring, information developed that indicated Caceres and two other individuals were conspiring to commit a robbery of cash proceeds at Jake’s 58 Hotel & Casino in Islandia. Those individuals are Bruce Moeller, 32, of Port Jefferson Station, who is employed as a Nassau County Police Officer, and Christina Moeller, 29, of Port Jefferson Station, who was employed at Jake’s 58. The conspiracy involved an alleged plan by Caceres, Mr. Moeller and Mrs. Moeller to rob a patron of the casino of his proceeds. Following receipt of the photograph, Mr. Moeller and Caceres drove to the casino. “As we can see in the casino’s surveillance footage, the two then proceeded to search the casino for the patron in question, but proved unsuccessful in their efforts to follow the patron out of the location, thereby thwarting their plan to commit the robbery,” District Attorney Sini said. The second conspiracy involves an alleged plan by Mr. Moeller and Mrs. Moeller to rob a vehicle that transports the casino’s money. On May 4, Mrs. Moeller sent a text message to Mr. Moeller identifying the vehicle that handled the casino’s money as “Rapid Armor” and identifying the employee assigned to guard the vehicle at that time. “Bruce Moeller had used his visit to the casino to case the location in furtherance of his desire to rob the armored vehicle of the casino’s cash proceeds, which would have provided a significantly larger theft of cash had the plan come to fruition,” District Attorney Sini said. Bruce Moeller and Christina Moeller were indicted on June 15 on two counts each of Conspiracy in the Fourth Degree in connection with the two alleged robbery conspiracies. Daniel Caceres was indicted on one count of Conspiracy in the Fourth Degree in connection with the alleged robbery conspiracy on May 11. Caceres was arraigned in front of Suffolk County Supreme Court Justice Timothy Mazzei on June 20. Bail was set at $300,000 cash or $600,000 bond. The remaining defendants will be arraigned on the indictments at later dates. The cases are being prosecuted by Assistant District Attorneys Nicole Felice and Tisha Burrows, of the District Attorney’s Office’s Narcotics Bureau. Subject: LongIsland.com - Your Name sent you Article details of "Suffolk DA Sini, DEA Announce Indictment Of 13 Individuals, Including 3 Nassau County Police Officers, on Drug, Robbery Charges"